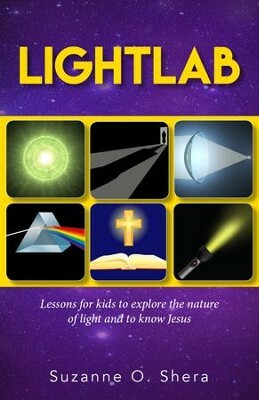 Lightlab is a book for children between ages 8 and 11 that teaches them about the nature of light and Jesus as the light of the world. It consists of twelve lessons on the characteristics of light, with engaging hands-on activities and Bible studies. Children will also learn about the contribution of scientists especially those of M. Faraday and J.C. Maxwell who were also devout Christians. The Bible studies revolve around God as the Creator and His plan for mankind through Christ Jesus. Suzanne O. Shera teaches math and science part-time to various age groups. She is also involved with the AWANA ministry and enjoys helping with VBS programs. Her greatest passion is to spread the Gospel message to children and teaching them about light is a powerful tool. Light is mentioned in the Bible hundreds of times, beginning with Genesis 1:3 until Revelation 22:5. Therefore, Suzanne's desire is to reveal that just as light is indispensable to the survival of mankind on Earth, Jesus is essential to our relationship with our Father in Heaven. Tell us a little about yourself. The fascinating properties of light captured me since High School and motivated me to earn degrees in Physics and Optical Engineering. After working in research for eight years, I stayed home with my first child. I continued to teach Math and Science part time at the community College and homeschool groups. I also helped in Sunday schools, many summer VBS and AWANA. The ideas for Lightlab lessons evolved since 2009 when I was given the opportunity to teach 8-11 years old kids at church. In my spare time, I love to spend time with my husband and friends, enjoy walking and cooking. What was your motivation behind this project? My greatest passion is to spread the Gospel message to children, and teaching them about light is a powerful tool. Light is mentioned in the Bible hundreds of times, beginning with Genesis 1:3 until Revelation 22:5. Therefore, my desire is to reveal that just as light is indispensable to the survival of mankind on Earth, Jesus is essential to our relationship with our Father in Heaven. What do you hope folks will gain from this project? Throughout the book, the ideas of light science and Christianity are sequential and build on the previous chapter to maintain continuity. Children will learn about the properties of light and will be engaged in hands-on activities : building small circuits, creating sparks, examining shadows, learning magic tricks with reflection and refraction, experimenting with lenses, exploring the properties of white light , and more. The Bible studies revolve around God as the Creator and His plan for mankind through Christ Jesus. They explain our sinful nature and our need for a relationship with God. They emphasize the importance of reading Gods Word to know who He is, how He wants us to live, and how we can enlarge His kingdom by being salt and light so the whole world will know that He is Lord. How were you personally impacted by working on this project? Personally, the greatest impact of this project is that one can enjoy science and my faith in Christ at the same time. I discovered that the leading heroes in this field of Modern Optics were two Christian men : Michael Faraday and James Maxwell. I mention them in several chapters as I describe their contribution to science and their devotion to Christ. Anything else you'd like readers / listeners to know: Prior to deciding to publish this book, I tested the lessons on eight homeschooled children (8-11 years old) who attended LightLab classes twice a month. They loved learning about the science of light and were excited by the activities, After engaging in the playful atmosphere that the activities offered, the children listened attentively to the Bible lessons and learned more of Gods plan for mankind through Jesus Christ. At our last meeting, the children were able to demonstrate the lessons to their parents, confirming that the teachings were appropriate for their age group.